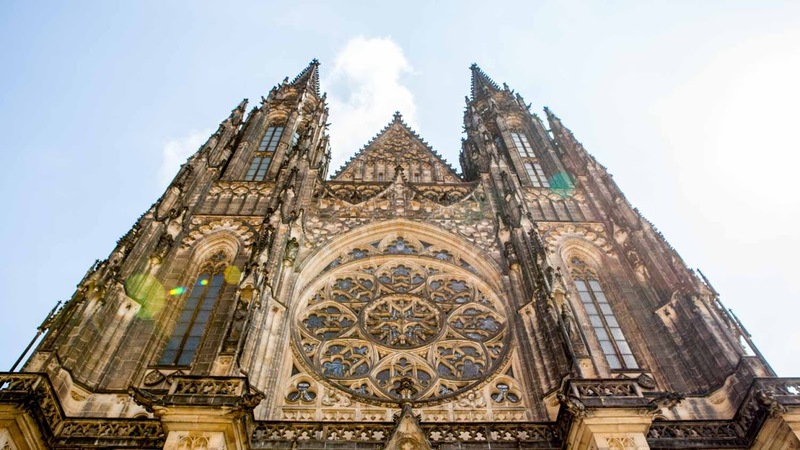 Explore Prague Castle, including the magnificent St. Vitus Cathedral, the Old Royal Palace, the Basilica of St. George and the charming Golden Lane. This sprawling UNESCO World Heritage Site was once the seat of the ancient Kings of Bohemia. Today, it is the most significant Czech monument and an important cultural institution in the Czech Republic. 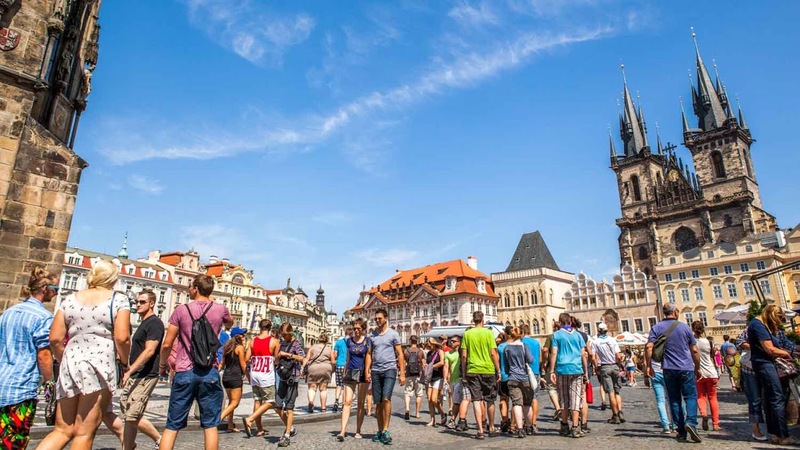 Here are some interesting factual tidbits about this Central European marvel. The largest castle complex in the world! With an area of about 215,000 ft² (over 18 acres! 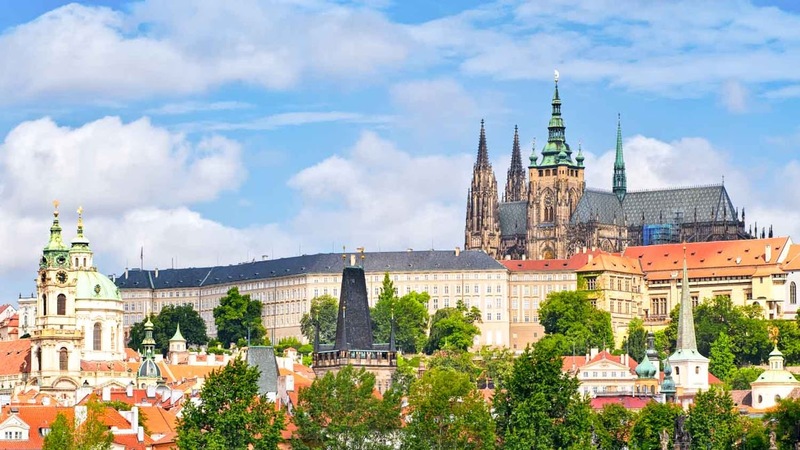 ), Prague Castle is the largest medieval castle in the world! Housed within the castle complex is the magnificent St. Vitus Cathedral. An amazing example of Gothic architecture, it remains one of the most important churches in the country. Due to hundreds of years of political changeovers and ever-shifting cultural influences, the castle complex features broad mix of architectural styles, from Romanesque to ornate Baroque. This small musical group (not in fact a full orchestra in residence) play outside the gates of the castle regularly for tourists and are worth hearing on your visit! 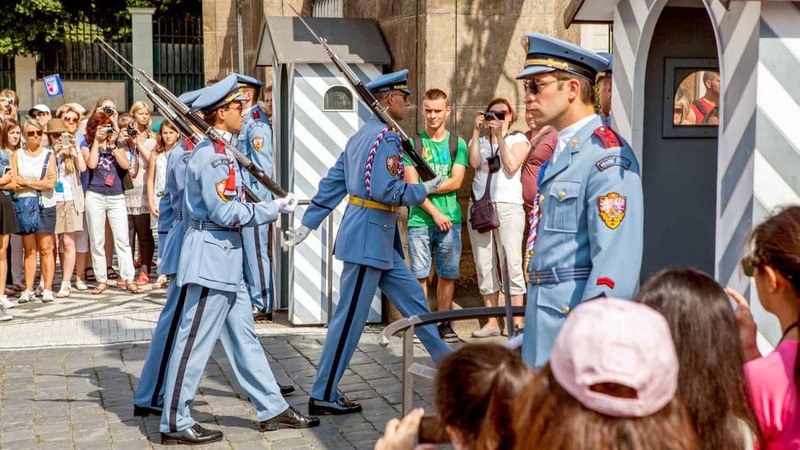 As Prague Castle is the official residence and office of the President of the Czech Republic, a Changing of the Guard ceremony takes place each day on the hour. The opening times vary throughout the year, so be sure to check the website before you visit. The Courtyards are open Apr-Oct: Daily 5:00AM - Midnight; Nov - Mar: Daily: 6:00AM - 11:00PM. 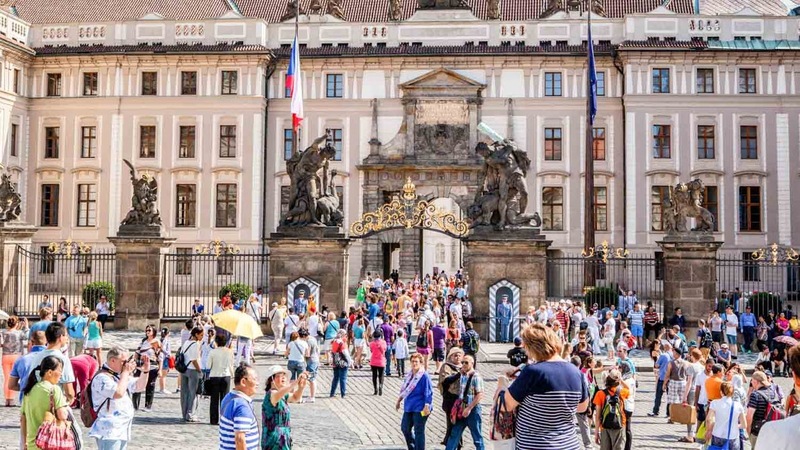 Prague Castle Buildings (Interiors): Apr - Oct: Daily 9:00AM - 5:00PM; Nov - Mar: Daily 9:00AM-4:00PM. With the castle complex being so large and so much housed within it, tours are advised. You can go on a guided tour, or take an audio tour and enjoy discovering the castle for yourself. There are different ticket options depending on how much of the castle complex you want to see. The most extensive option, which they call Circuit A, costs 350 CZK (about 15 US dollars). The discounted price for youth and seniors is 175 CZK and family admission is 700 CZK. Varies depending on the season. The Courtyards are open in the summer from 5AM until midnight. The castle buildings are open during typical work hours (9-5). The winter hours are only slightly more limited. It is free to wander around the Courtyards. Entrance tickets vary. It will definitely help. Check out our tours to find the best fit for your excursion. If you want to go by foot, prepare for a scenic but quite steep trek uphill. To save your calves, you can take tram 22 to Pražský hrad and leave by metro from Malostranská station. Want to snap some photos inside the castle buildings? Make sure to purchase a photography license from the ticket stand.